Aspiring aviators brushed shoulders with the pros Wednesday, gaining invaluable insights about the industry during Delta’s 18th annual Dream Flight. 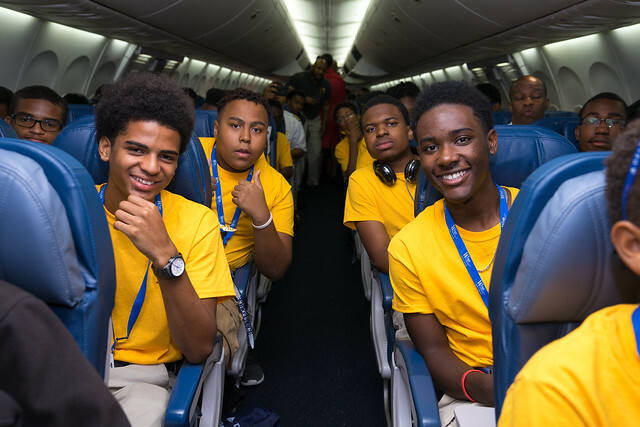 The flight was one of many highlights for students attending Atlanta’s Aviation Career Education (ACE) Academy, a weeklong program presented by the Organization of Black Aerospace Professionals and sponsored by Delta. ACE Academy provides students with mentoring, training and exposure to dozens of career paths in the aviation and aerospace industries. The Dream Flight supports Delta's commitment to seek diversity and promote inclusion. First Officer Kyle Greene knows firsthand the life-changing impact the program can have on aspiring aviators. He is a 2007 graduate of the Atlanta ACE Academy. This year’s Dream Flight traveled from Atlanta to the Steven F. Udvar-Hazy Center, a companion to the National Air and Space Museum outside Washington, D.C. The pilots who flew the group included former ACE Academy graduates. Other pilots joined the trip, sharing words of wisdom and encouragement to the 150 students on board. Lamont Hutto, 17, was one of the aspiring aviators on the Dream Flight. A student pilot, Lamont has completed the group’s Solo Flight Academy and, this month, flew his first plane. He said he’s grateful for ACE Academy and the Dream Flight because they expose young people to new environments and allow them to learn and build relationships. During their tour of the Udvar-Hazy Center, students had the opportunity to view aircraft flown in war and to outer space, experience a flight simulator, learn about space science and watch a 3D film in the facility’s IMAX Theater. Capt. Robert Brown, chair emeritus of the Organization of Black Aerospace Professionals, said the objective of ACE Academy is to motivate youth to strive and dream big.